Hard to believe, but the New Year is here. For most of us, this time of year is full of resolutions, setting goals, and trying to accomplish things that we didn’t quite have time for in 2016. For me, listening to new music could be a resolution—but it’d be an easy one since I always try to listen to a new album every month. While today’s band may not be new to me, I realized that I’ve never threw on an album start to finish, so mission accomplished three days in. The lead guitarist’s brother was drafted into the military but did not report for duty. His home was raided, but the brother slipped out a rear window and defected to Canada. It was by happenstance that Hocus Pocus was playing a show where he met Ann and the two fell in love. Ann moved to Canada to be with him and the rest of the band would follow suit shortly after. Ann’s sister, Nancy, joined the band in 1974, the band was repackaged yet again as Heart and they began touring all over their new home in Vancouver. Heart threw together a demo tape in a small studio called Can-Base in Vancouver. A handful of Canadian investors who backed the studio created a small label called Mushroom Records, managed by Shelly Siegel. Siegel thought Heart’s music was really on to something and picked up the demo tape. The band named it “Dreamboat Annie” and Sigel sold 30,000 copies in the first couple months. It was released as a full studio album in Canada in August of 1975. After the acclaim up north, the label and the band took “Dreamboat Annie” to L.A. where it would be released in the U.S. in February of 1976. The success only strained relationships, however, as the small label and band didn’t really know how to handle it. The two sides feuded and eventually landed in court to part ways and end a slanderous article the label took out against the band in Rolling Stone. Heart has sold nearly 40 million albums worldwide, with 23 million being in the United States. Needless to say, the public and ugly split with the label didn’t slow their momentum in the industry. 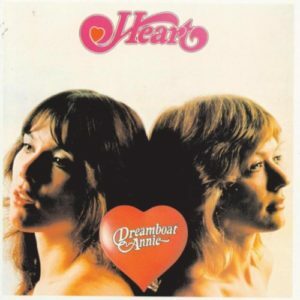 When you browse through Heart’s catalog, you will find so many singles that you’ve heard a million times on the radio. They’re all identifiable because Wilson’s vocals are so distinct and outstanding. The band has gone through more members and more lineups over the last four decades than I can count, but the Wilson sisters still do a few shows to this day, and can belt out their classic tunes like it was still 1975. Admittedly Heart isn’t the first band I think of in terms of iconic 70’s rock n’ roll, but they should be more involved in the conversation than they seem to be—a very under appreciated act that has so many good records. Start your 2017 off right by putting on some good tunes, and Heart’s “Dreamboat Annie” certainly qualifies. I plan on throwing on a couple more of their albums today as well, just to see what other hidden gems I’ve missed out on over the last 30 years.